If you feel like you're seeing Nomadic Fungi everywhere you look, Your Right! NFI has two exhibitions running simultaneously this summer. Roadside Snacks is on display at the Art Car Museum in Houston, Texas as part of their 20 year celebration. And Nomadic Fungi: Germination To Propagation is on display at the Texas Discovery Gardens at Fair Park in Dallas, Texas as part of their State Fair of Texas celebration of nature and art. Roadside Snacks, the newest exhibition by the Nomadic Fungi Institute drew a horde of curious supporters as part of the Art Car Museum's 20th year celebration. I was most encouraged by the number of interested responses ... there were loads of questions with some people coming back two even three times with more queries. It seemed most people were curious how exactly nomadic fungi might impact their lives. Yes, I think some people were initially taken aback upon encountering a science based exhibition at an art museum. But once they started looking and reading they quickly realized the significance of the exhibition. It was gratifying to witness so many people taking time to closely examine the the NFI lab samples and read the documentation. Overall, I felt the opening at the Art Car Museum was quite exciting. And as the exhibit shows through August, I hope it will continue to increase public awareness of nomadic fungi. My sincere thanks to the Art Car Museum for providing NFI with this opportunity. 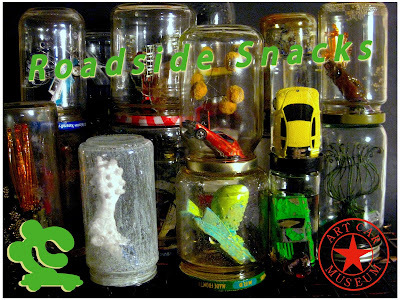 Roadside Snacks will be on display at the Art Car Museum from June 11th- Nov 28th 2018. 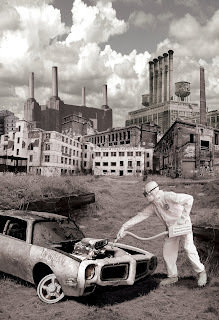 The Nomadic Fungi Institute presents, Roadside Snacks, a survey of eyewitness accounts and laboratory tests pertaining to the proliferation of nomadic fungi. The Nomadic Fungi Institute is a pseudoscience based "Institution" established to investigate and document sightings of giant mushrooms growing on automobiles. Also on display will be the latest NFI laboratory experiments to ascertain the probability and rate at which these parasitic fungi will spread and inevitably impact the American transportation system. 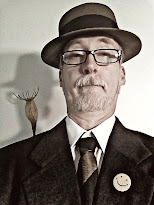 Dr. Brad Ford Smith, founded the Nomadic Fungi Institute in 2013 and has been fastidiously pursuing all leads pertaining to these mutated fungi. The opening is Saturday, June 3rd and has been extended through Nov 28th. Drop by and find out if you should be concerned about the knocking under your hood. Taking a clue from the mycelium of nomadic fungi, NFI is sending out ever bigger tendrils in search of new public resources to tap into. 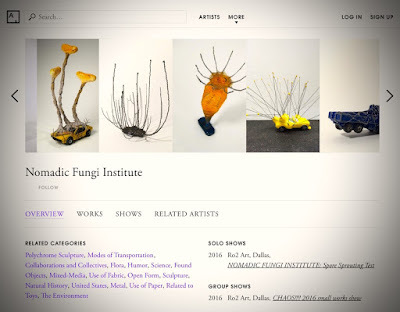 We are happy to announce that the Nomadic Fungi Institute is now listed on Artsy. Follow the link below and you will find an extensive inventory of NFI documents, lab samples, and photographs. Each of these items can be yours for a small suggested donation. All funds go to support the ongoing research of the tireless staff at NFI.